As I joined the over 7 million people who were absolutely glued to their televisions, YouTube and mobile devices, I thought, “you know, there’s a career lesson here.” Felix may have become an overnight success story according to all the news outlets, but we all know there’s more to the story of his recent accomplishment. So, as my heart rate returns to normal from the thunderous, nervous pounding during the jump, I’d like to share my observations with you. Always be prepared. Felix had a backup plan for his backup plan’s backup plan. What if something went wrong? What if his parachute didn’t open? What if the heat visor malfunctioned? What if his helmet fogged up? (By the way, it did fog up – I nearly passed out as I watched his body tumble through the air at 800+mph.) While he may not be an official Boy Scout, Felix adopted the “Always Be Prepared” motto and took the necessary precautions, calculating his risks along the way. In your career or job search, are you prepared? Passion fuels purpose. This guy had a serious goal. Set the world record for skydiving, jumping from the edge of space. Seriously, a little farther out and he would have floated off into the abyss. His passion and dedication for accomplishing his goal is like none that I’ve experienced before. Here was a guy that everyone said was crazy. Was he? Maybe. Did he accomplish his goal by following his passion? You bet he did! Do your goals align with that of which you’re truly passionate? Teamwork makes the dream work. Felix didn’t do it alone. He had a lot of supporters – friends, family, co-workers and even Capt. Joe Kittinger. If Joe’s name doesn’t sound familiar, he’s the guy that held the skydiving record until Felix’s jump. That record for the highest and fastest free-fall was set 52 years ago. Felix surpassed Joe’s record by 4 miles and was faster by nearly 219 mph. Kittinger was there to see Felix break his records, too. He was the primary communicator to Felix via Red Bull’s Stratos mission control in Roswell, NM. Each team member played an important part. Trust was crucial to the mission’s success. Who is on your team in your job search? Can you count on them during “mission-critical” situations? Felix probably has his faults. I’m not saying he’s perfect. No one is. Is he crazy for following his passion and chasing his dreams? Heck no. Does Red Bull give you wings? Maybe. I think Felix earned his wings without the caffeine boost. He worked hard and accomplished his goals. 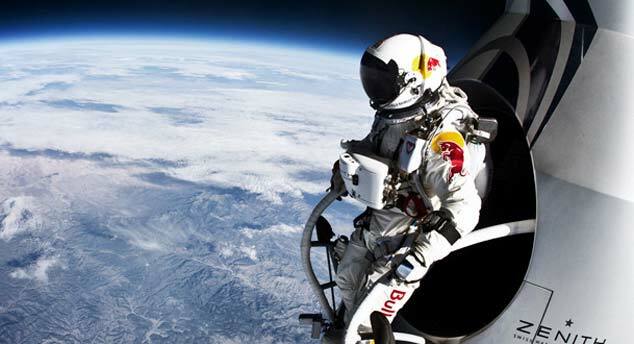 After watching him plummet towards the earth at 833mph the last thing I need is Red Bull. My heart would probably leap from my chest! Watch and see if you can pick up on other career lessons. When you find them, please share them with everyone by leaving a comment! Thank you for this timely article! The most important point you’ve made in this article is related to the passion that it takes to both fuel and accomplish personal and career goals. It is impossible to set and accomplish career goals without the force of your own passion and drive. It’s surprising what can be accomplished with a little bit of passion and determination. I love this! Watching Felix jump from the very edge of space made my heart leap into my throat and my stomach clench in fear, but it also made me realize that the only way you get what you want in life, is by doing it yourself and working hard in the process. Having an awesome support system, being prepared for anything life throws at you, and just plain believing in yourself, you are already guaranteed to go a long way. Looking for optimal weather conditions. Our mood and approach are factors in the great job search. How are our weather conditions? Ready to go? An open and clear mind is important so that we can face rejections and any set backs without fogging our mind and thoughts and keeping us away from our end goals. Be emotionally prepared.